Launched in 1987, McAfee is an international computer security software company founded by John McAfee and currently a subsidiary of Intel Corporation. The company is headquartered in Santa Clara, California, United States with operations all over the world. McAfee main target markets include businesses, home users, and the public sector. Since its inception, McAfee has been on the first line in the provision of proactive and proven security services and solutions for systems, mobile devices and networks across the globe. The company attributes its success to continued investment in innovation, product development, and excellent customer services. Today, McAfee is an employer of over 8000 people and earns revenue of over $2 billion annually. The company has won various awards including the best database security award in 2013. McAfee operates online through its website www.shopmcafee.com. The site is available in over 70 languages and is easy to navigate hence making it suitable to all types of users. Available on the site are numerous protection solution products and services with a comprehensive description and specifics attached. Users can download free trial software on the website after which they will be required to make a purchasing decision once the free trial period has expired. At the site, customers can shop by category to include desktops, email and web. The company offers all types of products and services useful for businesses and consumers alike. Whenever you visit the website, make sure that you choose the appropriate option. For business users, their products and services are categorized as enterprise businesses with more than 250 employees, or as a small business for a company that has fewer employees than that. With the dramatic rise in popularity of mobile devices, it seems like everyone has one. Hackers know this and frequently attack those devices as well. Make sure that you at least give the McAfee Total Protection software a glance since it will protect all of your devices ranging from desktop computers to your mobile tablet. It'll definitely be a great deal if you get the software with the aid of a McAfee promotional code. The company is active on various social media networks such as Facebook, Pinterest, Google+, Twitter, and YouTube. Once you connect with them on these networks, make sure that you stay on the lookout for a McAfee promo code in the future. 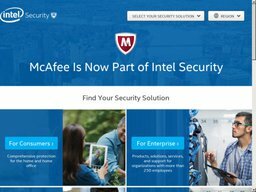 At McAfee, you can shop for products and solutions such as database security, data protection and security, endpoint protection, server and storage security, email and web security, mobile security, next generation firewall and network security, risk and compliance, security management, among others. The company also offers training and advisory services all over the world. McAfee offers most of its products at discounted prices with most products retailing below $100. They cater to individual Consumers, Enterprise Users, Small Businesses, and others. McAfee accepts payments through Visa, MasterCard, American Express, JCB, and PayPal. So you don't have to spend as much money, make sure that you take a McAfee discount code with you when you shop on their website. The price to pay for protecting your information is a small one, but you can make it even smaller by using a coupon. Just add the products that you want to purchase to your cart then make your way to the payment screen. It will be there where you will need to enter your McAfee coupon code. McAfee products are delivered to customers via digital download, so there are no shipping charges. For unsatisfied customers, returns can be made within 30 days of the purchasing day for a refund. In the case of automatically renewed subscriptions, returns can be made within 60 days of the purchasing date for a full refund.